A NEW CREATION HAS BEEN LAUNCHED! You all are now at a threshold. It is the most important one since the last 26.000 years in your history. But it is even more important than that, because what is happening now, is for the first time about the complete removal of the dark forces. In all these last Millenniums, and even in the last great cycles before, they have been able to interfere with the light. Even though there have been epochs where they were existing outside your experience, they still were able to wait for a time when it would actually become possible for them again to impede. But even this possibility has now come to an end! They will not be able to interfere for good on your planet and in your universe anymore, as you now have gone through all the challenges of growth in Divine Consciousness, as all the steps required by the Mind of God to deal in consciousness with the archetype “light and dark” has now been sufficiently explored and lived, so that there is for your existence no need anymore to deal with this great affair of creation! Please understand what this means: a grand cycle in the process of creation has been coming to an end, and creation is now on the way to return to its very Source. Although this process of the full reverse will happen in what you still experience as time and will not just occur overnight, in the mind of God this reversal has been sealed already. The difference with this new 26.000 year cycle to earlier ones is, that there will be no return into darkness anymore. This is the decree which has been granted to the human races in the universe after they have been suffering and struggling in endless wars and times with the forces of the dark. 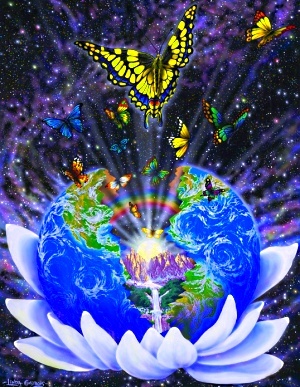 Now Divine Light will invade all denser frequencies and dimensions in your universe so that they vanish in that Light. This is the most glorious moment in your history as a new creation has been launched that allows the worlds of form to be merely of the Light and the full expression of Love to expand as far and wide as the joy of Heart is desiring it! So that this Light of God penetrates every corner and atom of the manifested universe and lives in it, a universe which is utterly transparent to the One and Original Will of God Who Is Pure Love and Enjoys to Experience Him/Herself As Such. This is the new creation we all have been waiting for. But to arrive there, first the fight with all that is not of that Radiance in manifestation, had to be fought in consciousness to the very bottom, to make sure there would never be a return to these low levels of consciousness and density, because everything must be recognized fully as that what it is to be released in the Heart of One. Human spirit all over your universe has been able to come to this understanding, but you, humanity on your Mother Earth, have contributed an important part to this outcome, as a sufficient number of you has broken through the darkest darkness and forgetfulness of the Light of God. It has been done by you who reached the deepest point of darkness consciously and brought it all back to the Divine Source. This heroic act was needed to finally end this drama of darkness and suffering, as it has been fully recognized in consciousness by this act and the process of return. This is the most glorious moment, Beloved Ones. Know that the days of darkness are numbered. And when the inherent influence of it has been fully removed, it will be for humanity like recovering from a very long standing illness. All will be healed, but if the illness was close to death full recovery will need longer. But all will recover as the spark of your New World has been planted in their heart already! This is a time where not just cycles repeat themselves! This is a moment in the Heart of God where New and Great Creations are initiated, which have never been seen before! It is an event of unspeakable Greatness and Divinity, where there is only Joy and Happiness, a Dance of Creation in the Fullness of Perfection. Dearest Ones, only be a little patient for this moment to arrive where the manifestation of all the promises will burst forth, and We remind you, just to see what has already been accomplished and what your heart tells you will shortly emerge, to evoke already major changes in the world you already know. Widen your heart to Infinity and up high and receive the Light from the Radiant Source to nurture the Love that your Are, to express It already now in a dying creation of the old where darkness has been allowed. You are so much Blessed! I Am Sananda at the threshold of the Galactic Center! Sharing of this message is only allowed together with this information and without any changes. If you have questions, please contact me via transformation33@gmail.com. Thank you.